Silver 'War Badge' record awarded to all casualties discharged from service. Daniel Johnson - possibly on return home after illness and discharge from service in India. 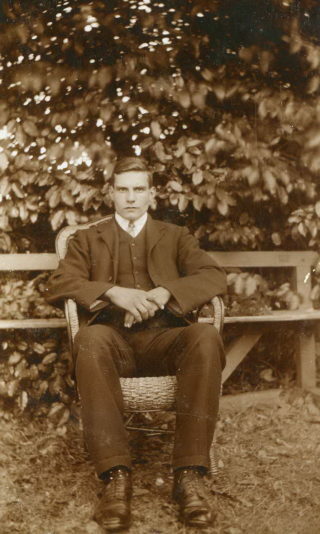 Isaac Johnson was born in Muston in 1890. His parents were John and Annie Johnson. John was an iron stone labourer until he took up work as a railway plate layer for the Great Northern Railway in the 1890s. 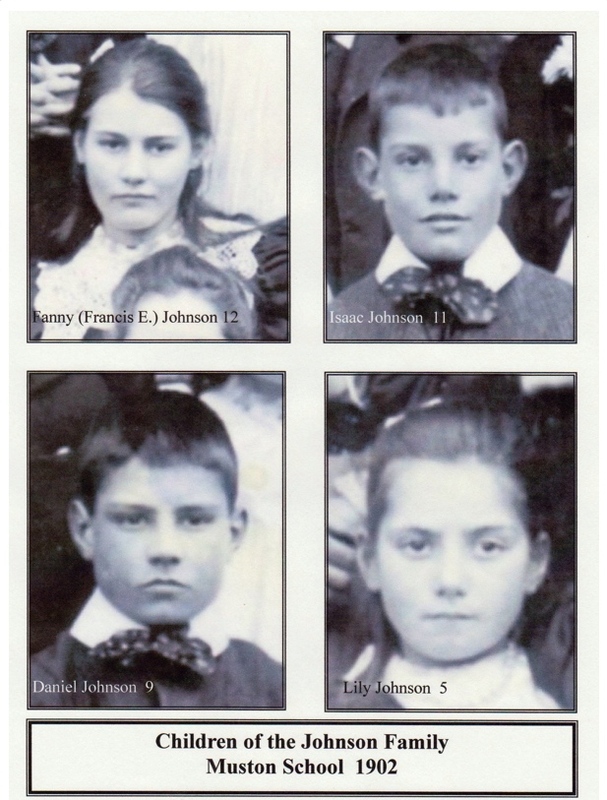 By 1901 John and Annie had five children – Frances aged 12, Isaac aged 11, Dan aged 9 and Lily aged 5. There was also an older brother Frank who was not named on the 1901 census. Isaac would have left school in 1902 aged 12 years old to work as a cowman presumably on a local farm. He then followed his father’s example and became a plate layer with the Great Northern Railway sometime before he enlisted. The exact details of Isaac’s military service are uncertain. He apparently served with both the Royal Engineers and then the 24th Battalion, Northumberland Fusiliers. During his service with the Northumberland Fusiliers in France he was injured and subsequently hospitalized back in England, first in Newcastle and then in London where he died on the 20th October 1918. Precise dates are given for these events in a detailed obituary published in the Grantham Journal on the 9th November 1918. Unfortunately there are inconsistencies in the dates. Furthermore, what records that survive for ‘Isaac Johnson’ do not tie in precisely with the dates published in the Grantham Journal. There is no entry under his name listed in the Commonwealth War Graves register of 1st World War casualties. The date of his death in the Grantham Journal article of the 9th November is given as the 20th October, a Sunday. He was buried in Muston Church yard. The Grantham Journal was published each Saturday. In the obituary published on Saturday 9th November Isaac Johnson’s funeral is referred to as having taken place ‘on Saturday’. That presumably referred to the previous Saturday the 2nd November 1918. Despite apparent inconsistencies in dates in the Grantham Journal report the details provided in Isaac’s obituary are very informative. 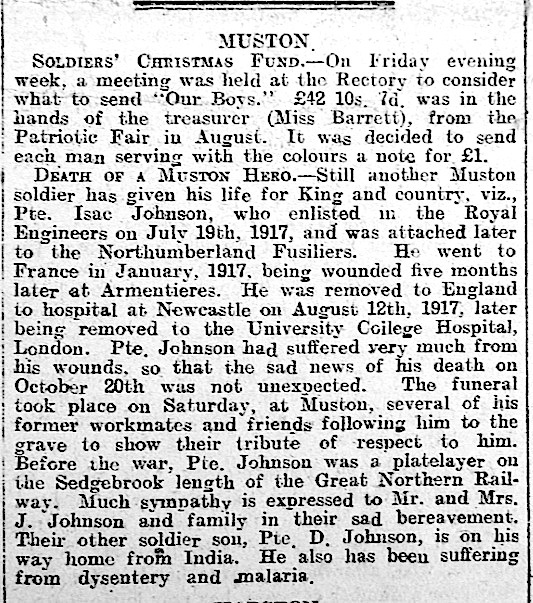 Death of a Muston Hero – Still another Muston soldier has given his life for King and Country, viz., Pte. Isac (sic) Johnson, who enlisted in the Royal Engineers on July 19th, 1917 (sic), and was attached later to the Northumberland Fusiliers. He went to France in January, 1917, being wounded five months later at Armentieres. He was removed to England to Hospital at Newcastle on August 12th, 1918, later being removed to the University College Hospital, London. Pte. Johnson had suffered very much from his wounds, so that the sad news of his death on October 20th was not unexpected. The funeral took place on Saturday, at Muston, several of his former workmates and friends following him to the grave to show their tribute of respect to him. Before the war, Pte. Johnson was a plate layer on the Sedgebrook length of the Great Northern Railway, Much sympathy is expressed to Mr. and Mrs. J. Johnson and family in their sad bereavement. Their other soldier son, Pte. D. Johnson, is on his way home from India. He has also been suffering from dysentery and malaria. The date of Isaac’s enlistment is stated as ‘July 19th, 1917’. It is likely that this should have stated ‘1916’ given that it also states that ‘(H)e went to France in January 1917’. This would have allowed at least twelve weeks of basic training and further training in advance of his active service. He became a casualty after five months of service in May 1917. 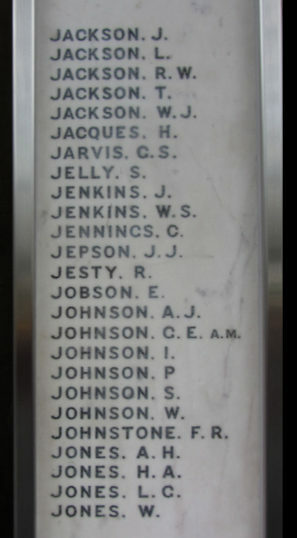 Isaac Johnson’s death was registered in St Pancras, London by his older brother Frank. 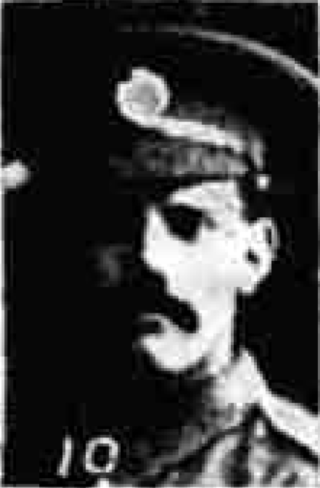 Frank’s brother-in-law had been killed in action in 1917. He would have been in a position to take on the burden of the required formalities. 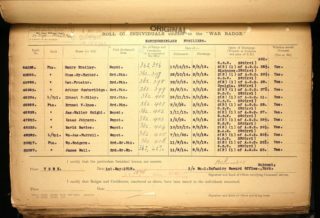 Frank was able to provide the registrar with information concerning Isaac’s war service. He travelled from Hull to London to fulfill that duty on behalf of the family. The death certificate gives details of his Battalion as the 24th Northumberland Fusiliers. Although the 24th Battalion had served in the Armentieres sector prior to May 1917 they were near Arras from the end of May 1917. It could be that Isaac sustained his injuries earlier in the year when the Battalion was near Armentieres. The precise details of Isaac Johnson’s seven months service and the period of hospitalization in France still need to be determined. In addition, although there are medal records and Silver Badge records for war wounds naming an ‘Isaac Johnson’ who served with the 24th Battalion, the dates of service do not tally exactly with those reported in the Grantham Journal. 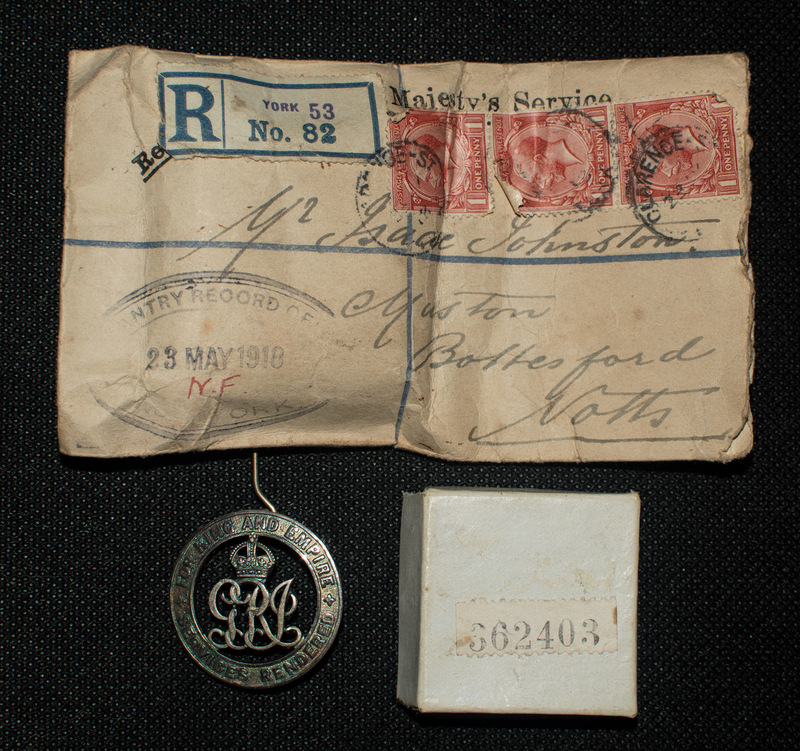 Further work is required to verify if these records are those for Isaac Johnson from Muston. To date we have not been able to locate Isaac’s grave in the Muston Church yard. It appears there is no headstone for Isaac Johnson in the area where his parents are buried. The post-war community in Muston acknowledged that he died as a consequence of his war service. 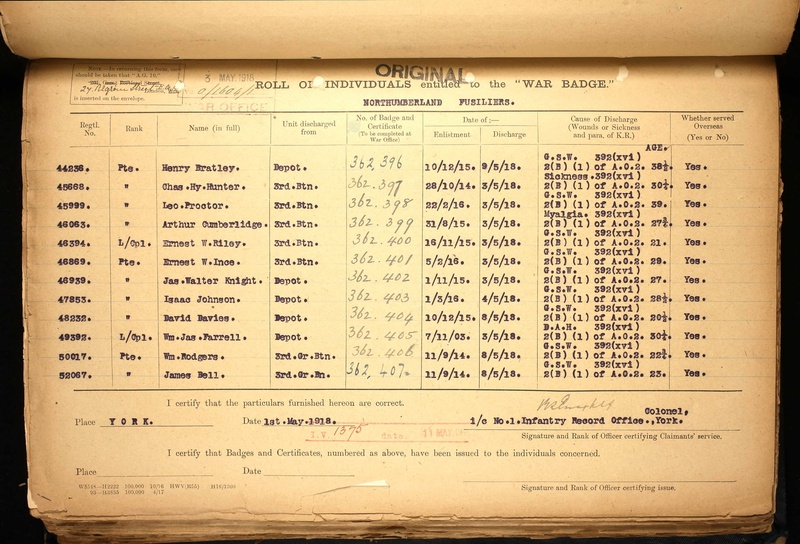 His brother ensured that both his employment as a plate layer and military service, with the full details of his Battalion, were recorded on Isaac Johnson’s death certificate. 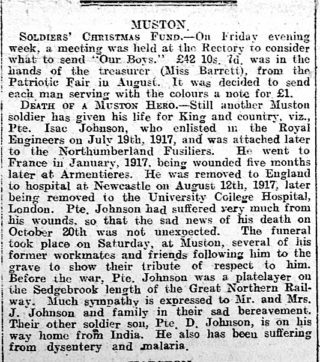 His name was included on the Muston War Memorial and the news of his funeral clearly states he ‘had suffered very much from his wounds’. 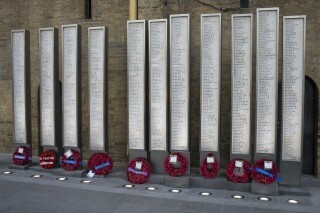 Furthermore, his employer also included him on The Great Northern Railway War Memorial. 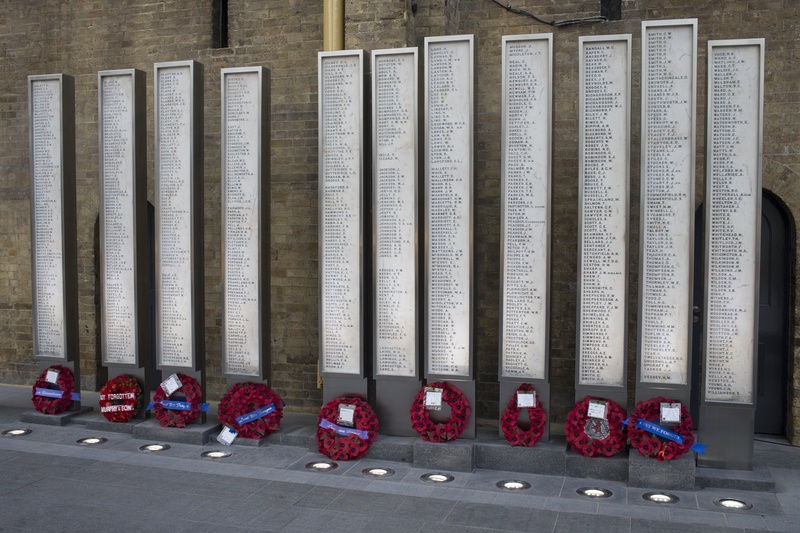 His name appears on the middle panel of the recently restored and reinstated memorial in the new arrivals hall at King’s Cross Railway Station. 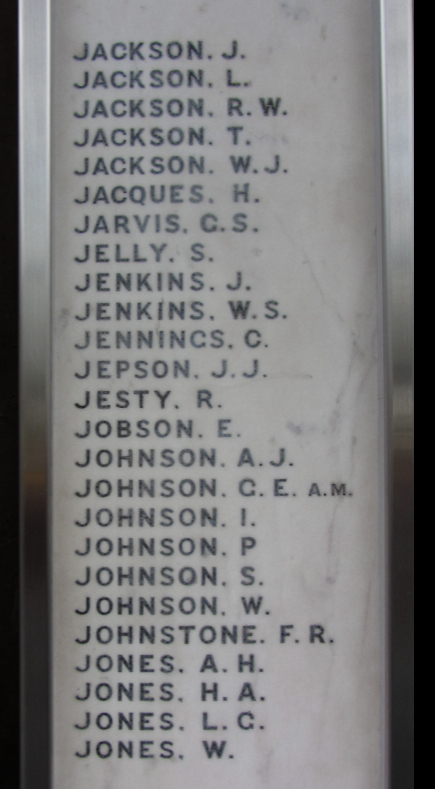 With further research it is hoped that the case can be established with the Commonwealth War Graves Commission for official recognition of Isaac Johnson’s as a casualty of the 1st World War. 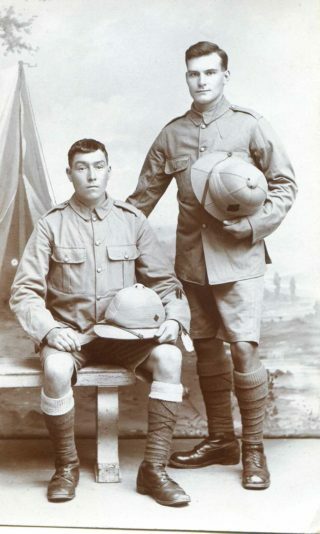 Family photographs, medals and details of Pte. Isaac Johnson’s Silver war Badge have been kindly made available by Paul Dujon. They confirm that his service number as 47853. 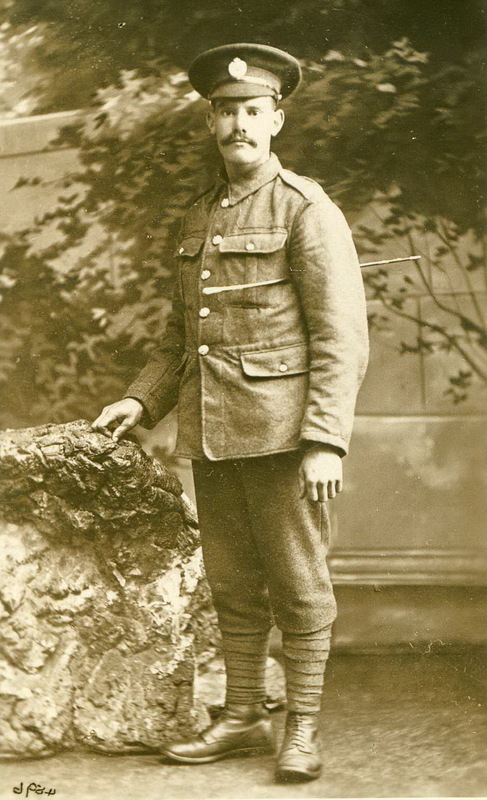 He received a Silver War Badge on his discharge resulting from ‘gun shot wound’ injuries on the 3rd May 1918 having enlisted on the 1st March 1916. This indicates that the the date recorded for enlistment in the Grantham Journal is an error, i.e., 1916 not 1917. In addition the date of the 19th July most likely refers to when he was called to duty. He could have attested on the 1st March 1916 after the introduction of conscription and then been drafted in the July. His death certificate records ‘ex Pte. att(ached) 24th Northumberland Fusiliers’. 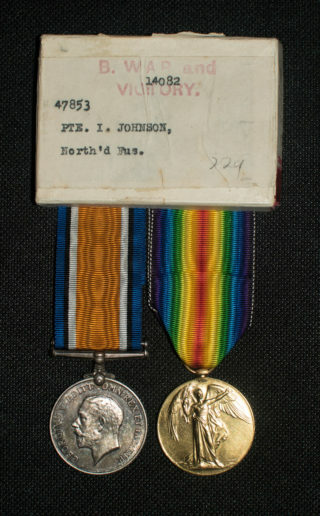 My name is Paul Dujon (47) from Peterborough, and Private Isaac Johnson was my great-great uncle on my mother’s side. I have his two service medals and some photos of him from my research into my family tree (including the box lid, that confirms his army service number). 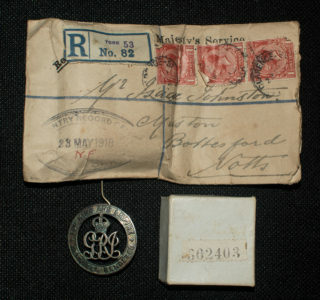 I also have a railway badge for “services rendered” the was sent to him in May 1918, in the original presentation box and envelope. I would be happy to send copies if this would be of interest? I also have some photos of his brother Daniel, and his medals too! That’s most interesting news and many thanks for establishing contact. We would be most grateful to receive copies of the memorabilia of Isaac Johnson’s service and that of his brother Daniel. If there are any family memories concerning their service and Isaac’s loss we would be most interested in recording those as well. 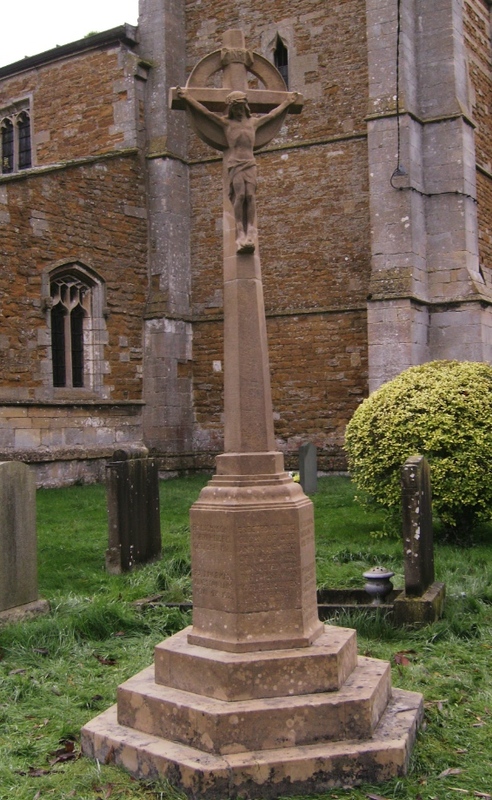 We have been unable to trace any Commonwealth War Graves Commission records for Isaac Johnson and have been in contact with them with a view to presenting a case for a CWGC Headstone in the Muston Church yard. Your family material would complete the evidence required. Family involvement in that process would be most welcome. We have a copy of his death certificate which records that he served with the 24th Bn. Northumberland Fusiliers. We can pass on a copy if you do not already have one.